I really shouldn't have let a month go by after my last display post; so much spring and summer stuff has rolled into stores since then that this is going to be a very long, very photo-riffic entry. You might want to grab a snack before you continue reading. 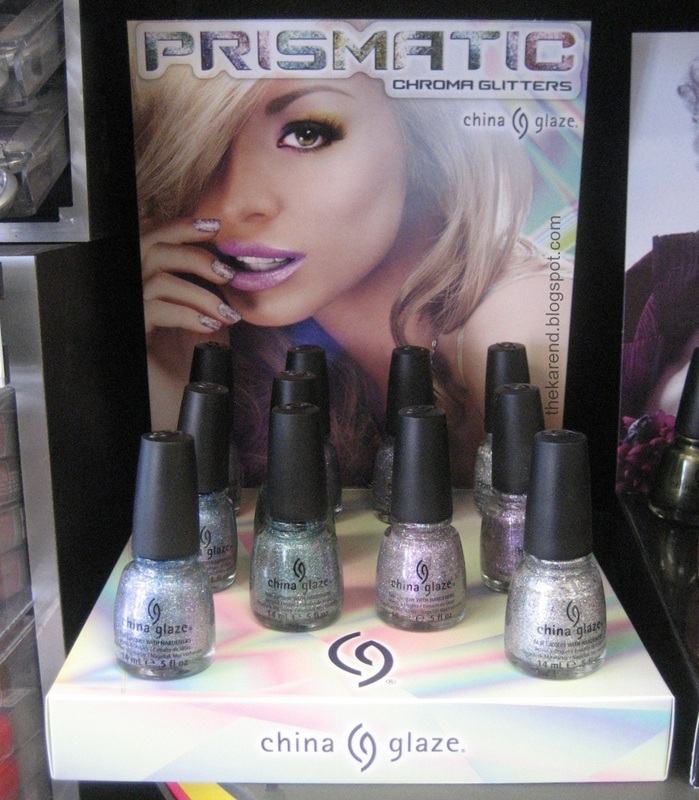 China Glaze Prismatic, which I was waiting to see when I did my last display post, did eventually show up at my Ulta. Six multicolored glitters here: Full Spectrum (red violet), Liquid Crystal (blue), Optical Illusion (blue green), Polarized (silver), Prism (blue violet), and Ray-diant (yellow green). 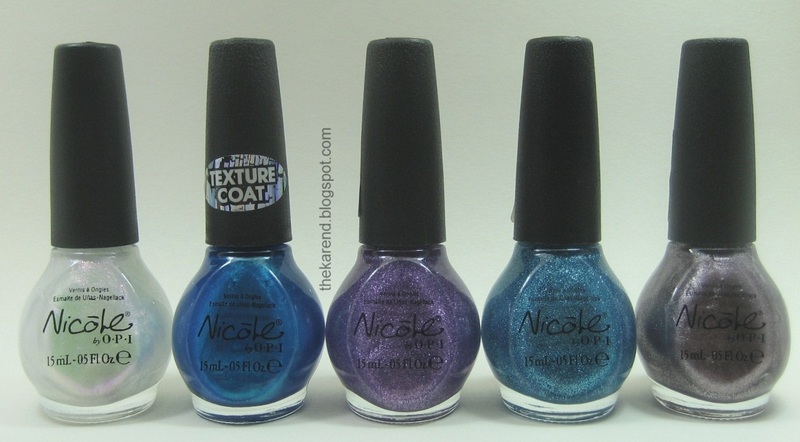 Prismatic also showed up at my Sally Beauty, but the bottles had black handles instead of silver as at Ulta (and the ones I bought online because I was impatient). I'm not sure what's up with that. 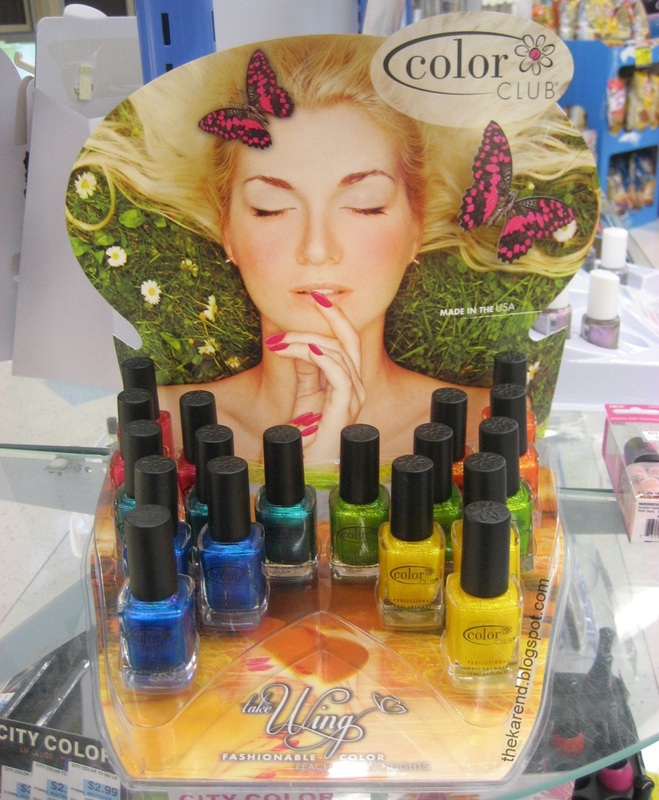 Color Club Blossoming, their spring collection, popped up at Rite Aid, of all places. I've never seen Color Club there before. 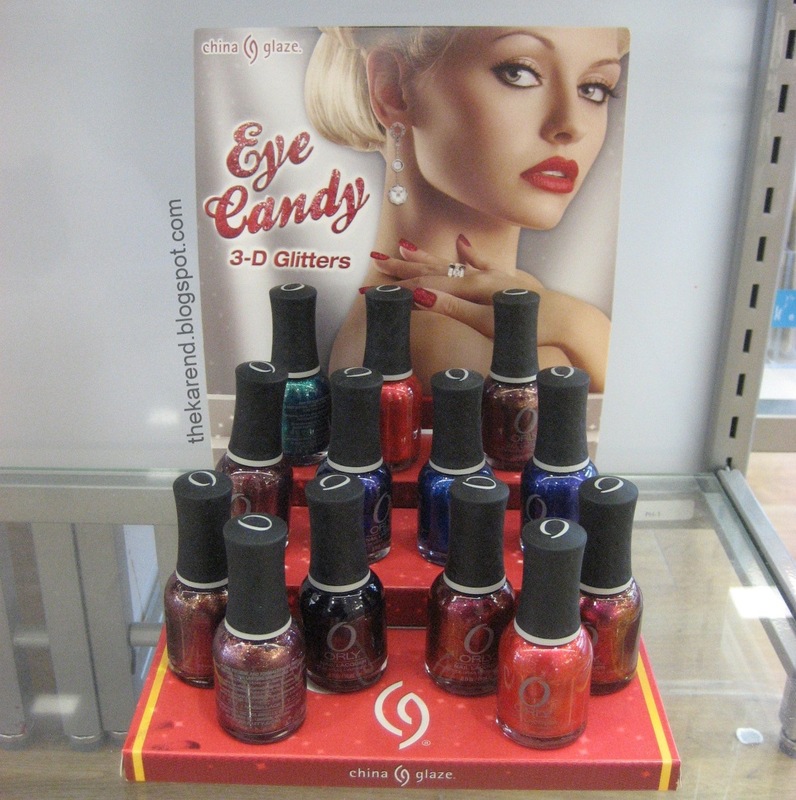 This particular display only had the cremes (Blushing Rose, Sweet Pea, Lavendarling, Hydrangea Kiss, and Blue-ming), not the Diamond Drops shredded glitter topcoat I also shared in my swatch post. I had to go to my usual Color Club source, Bed Bath & Beyond, to see the Magnetic Force display. Colors here are : Cop an Attitude (copper), Steel of the Night (charcoal), Electro-Midnight (deep blue), Hipnotic (berry red), Sci-Fi (old gold), and Magnetic Force (plum). 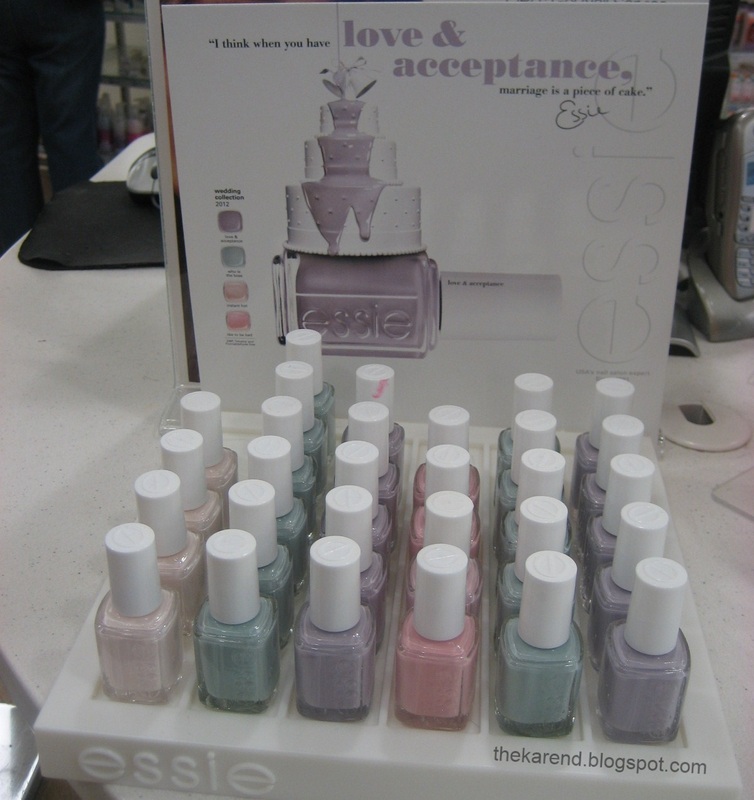 The 2012 bridal collection from Essie is called Love & Acceptance. I've only seen this at Ulta so far. 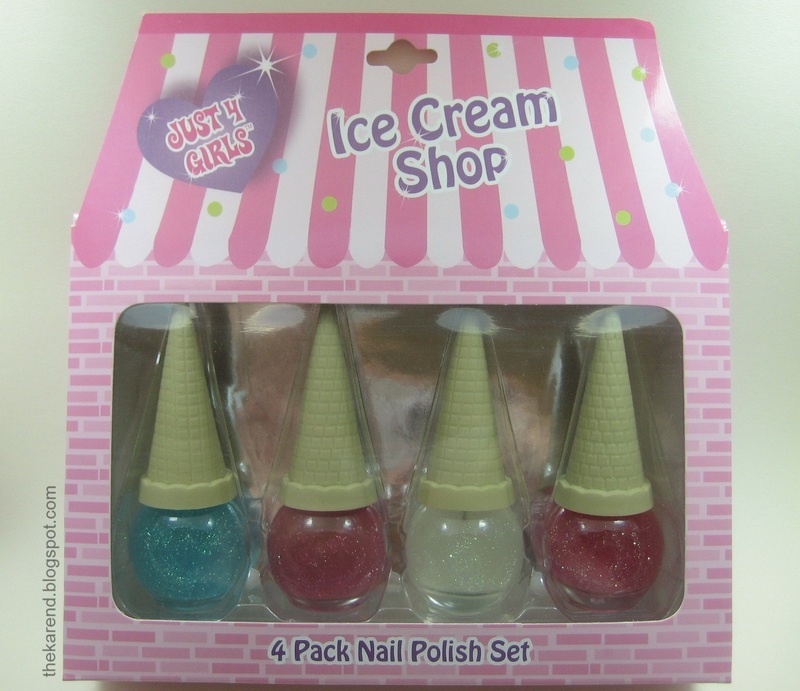 It has four colors: Instant Hot (creamy white subtle shimmer), Who Is the Boss (pastel seafoam green creme), Love & Acceptance (dusty lilac creme), and Like to Be Bad (warm pink subtle shimmer). 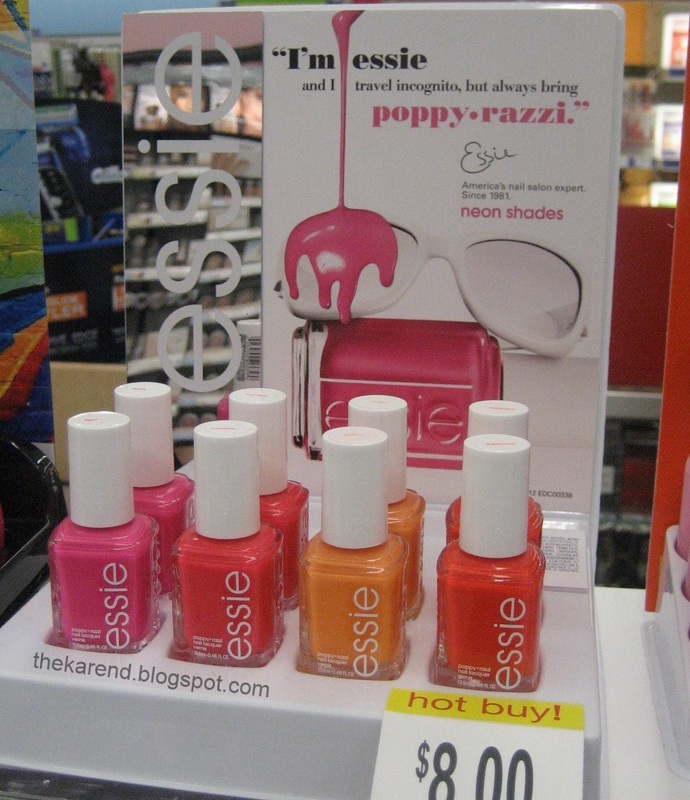 The salon display of Poppy-razzi at Ulta had white in addition to the four neons, along with directions to use the white as a base. 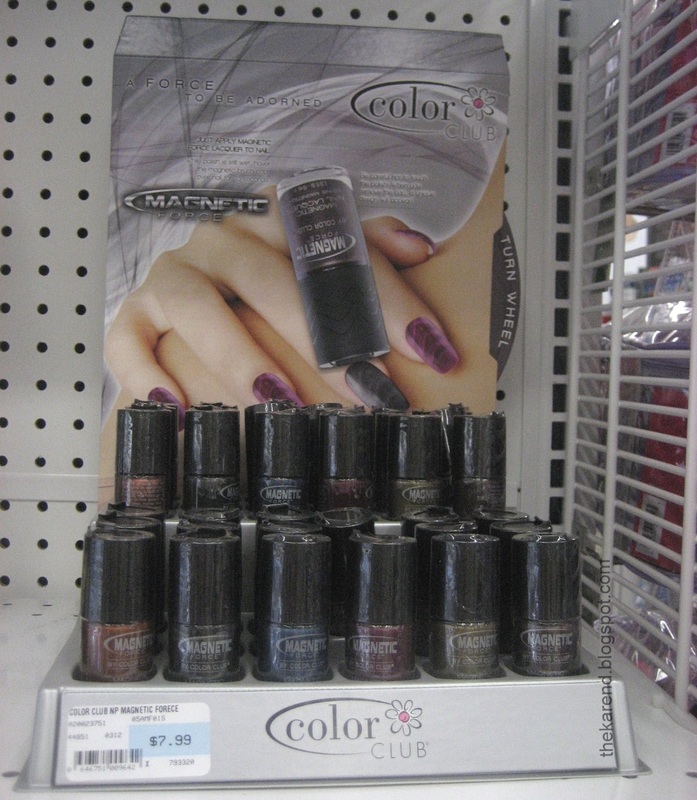 At Target, I saw an Essie display for a Metallics Collection. Buy Me a Cameo, Show Me the Ring, Pearly White, Steel-ing the Scene, Loop Hole, Fair Game, and Over the Edge. Several of these are marked as being "only at Target", but I think that means "only at Target right now" because I have some of them already and I did not get them at Target. 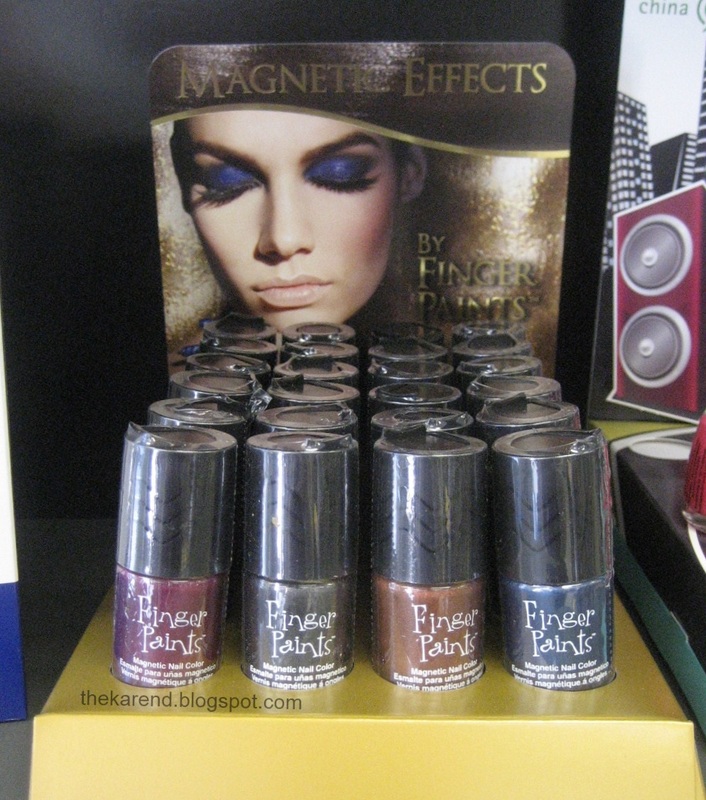 Finger Paints has hopped onto the magnetic bandwagon with Magnetic Effects. To accomodate the magnet in the cap, these bottles are shaped differently than the normal Finger Paints bottles. They look quite a lot like the Color Club magnetic bottles, actually. 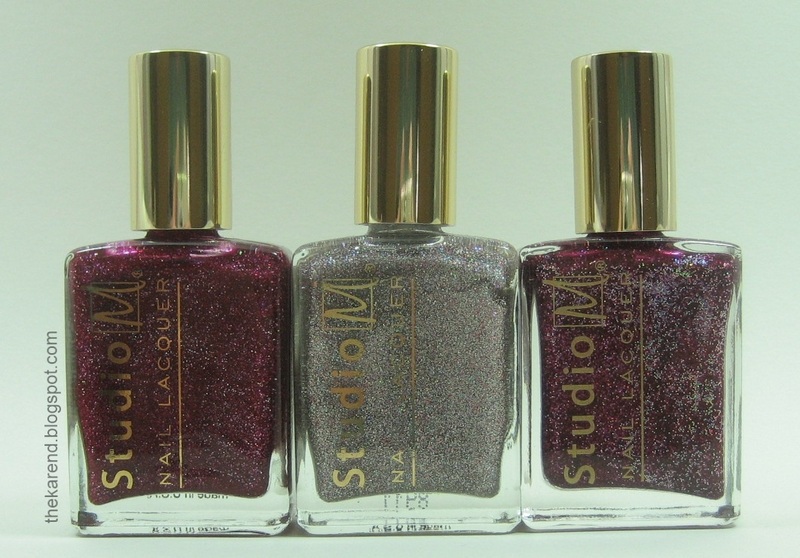 There are four colors, which you may also recognize from seeing the Color Club ones: Hipnotic, Steel of the Night, Cop an Attitude and Electro-Midnight. Layla Hologram Effect colors have arrived at Ulta, who doesn't seem to know quite what to do with them. Every store I've seen this display in, it's been in a different spot in the store: on the end of an aisle near the front, in the drugstore section, in the back of the store near the salon. Eight colors here: Flash Black, Ocean Rush, Mermaid Spell, Jade Groove, Ultra Violet, Retro Pink, Coral Gleam, Mercury Twilight. The display also has the special Hologram Effect Base File, which I have not bought because using Nfu Oh Aqua Base worked just fine when I tried Ultra Violet. 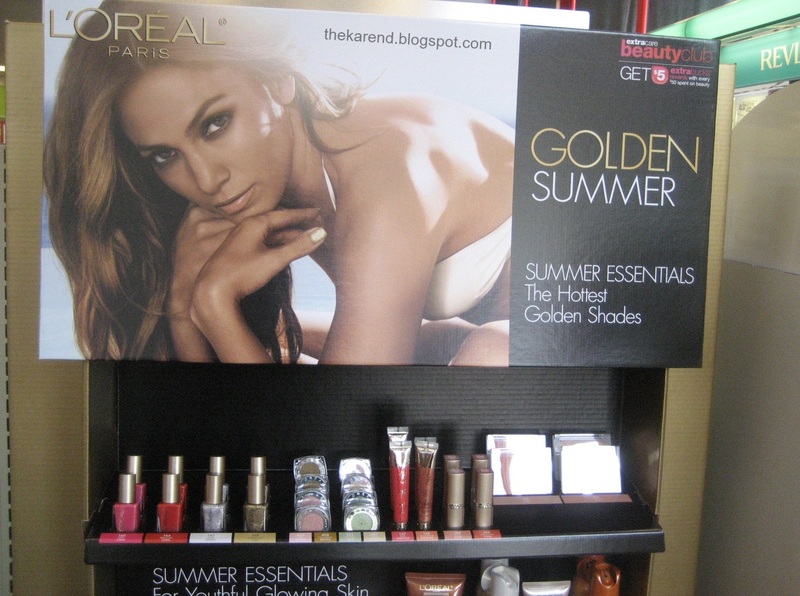 The L'Oreal summer display is called It's Gold or Nothing at All, and it has the first new polish colors I've seen from them since they re-launched them. Pink Carat and Precious Coral look like typical summer shades, and there are also two glitters, Silver Sparkle and Gorgeous Gold, which I will buy the minute I see a good sale price. 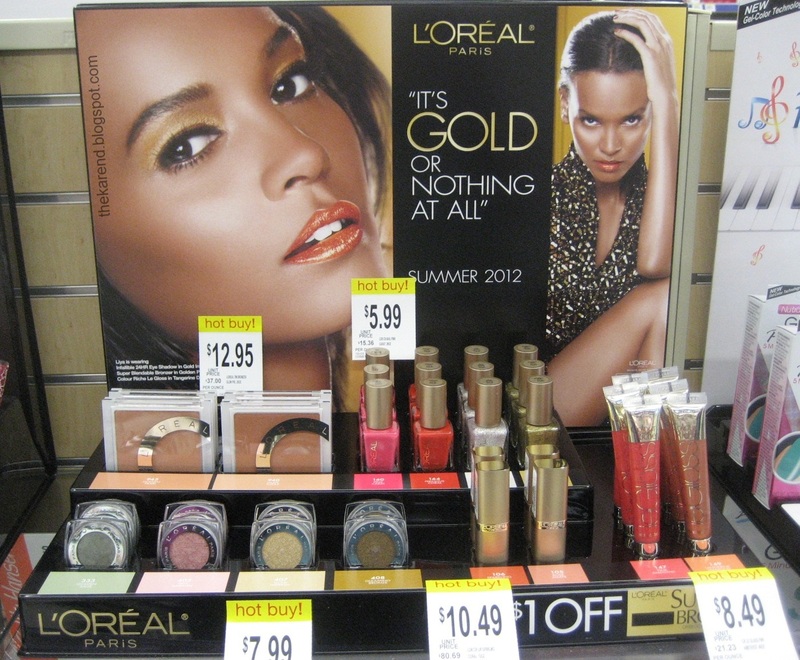 I've spotted these at Walgreens (shelf top display) and CVS (big end cap display called Golden Summer). I just can't resist adding close up bottle shot of Silver Sparkle, because it's a lot more interesting than it looked from a distance. Milani Pure Love has three polishes: Gray Tux (black with silver glitter), Wedding Dress (white shimmer), and Bridesmaid (platinum foil). OPI New York City Ballet display showed up at Ulta just after I did my last display post. 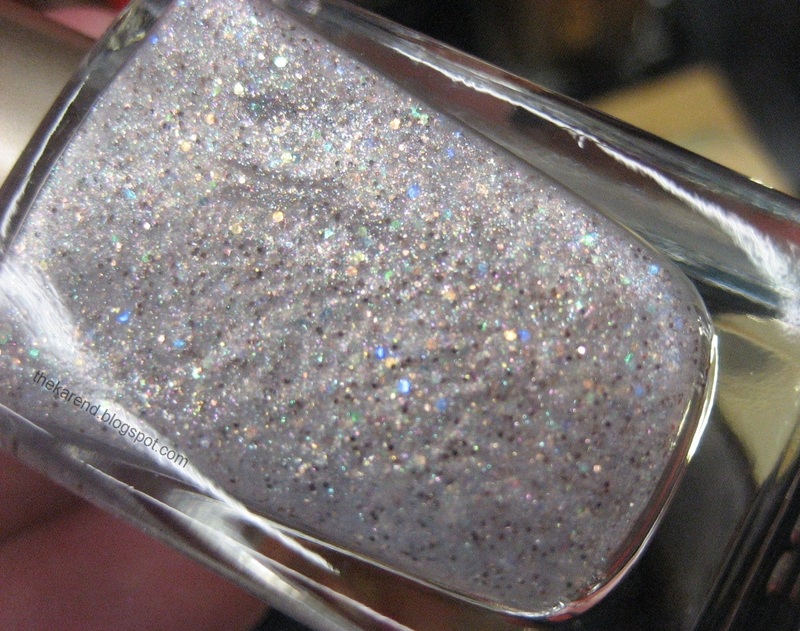 If I'd been clever, I would have included it in my swatch post that I not-at-all-cleverly called OPI New York City Ballet Collection, and this post would have been not quite so very long. 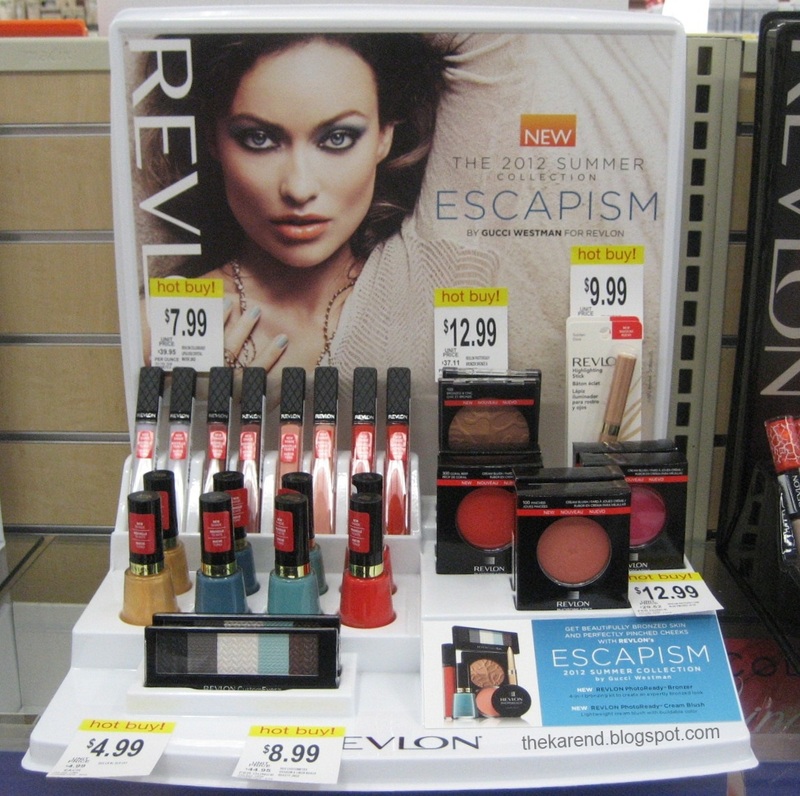 Revlon's summer offering is Escapism. 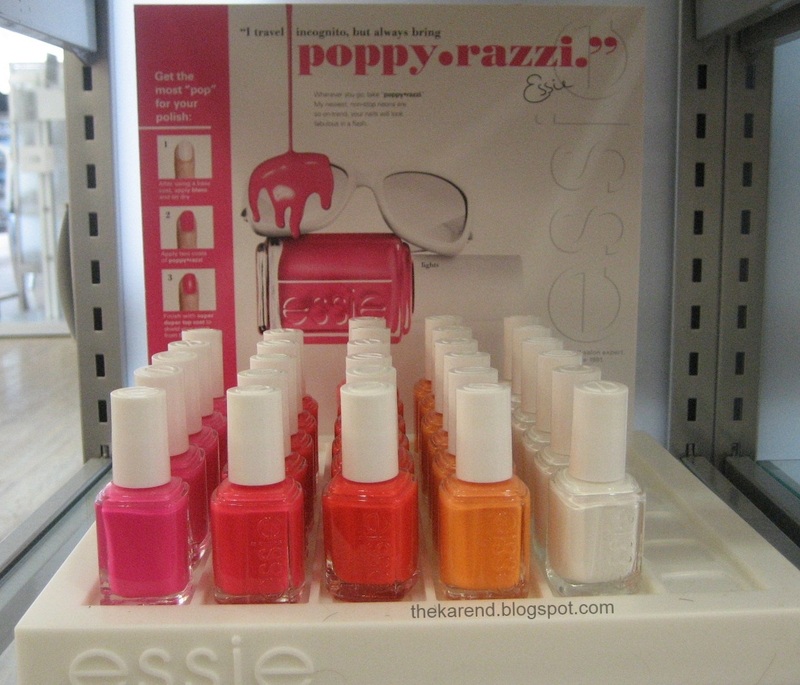 The four polishes in this display are labeled "new shade" and don't say "limited edition" anywhere, so they may be around for a while. Colors are Gold Coast (gold shimmer), Surf (dusty teal blue creme), Sheer Seafoam (sheer turquoise tint), and Red Bikini (orange red creme). 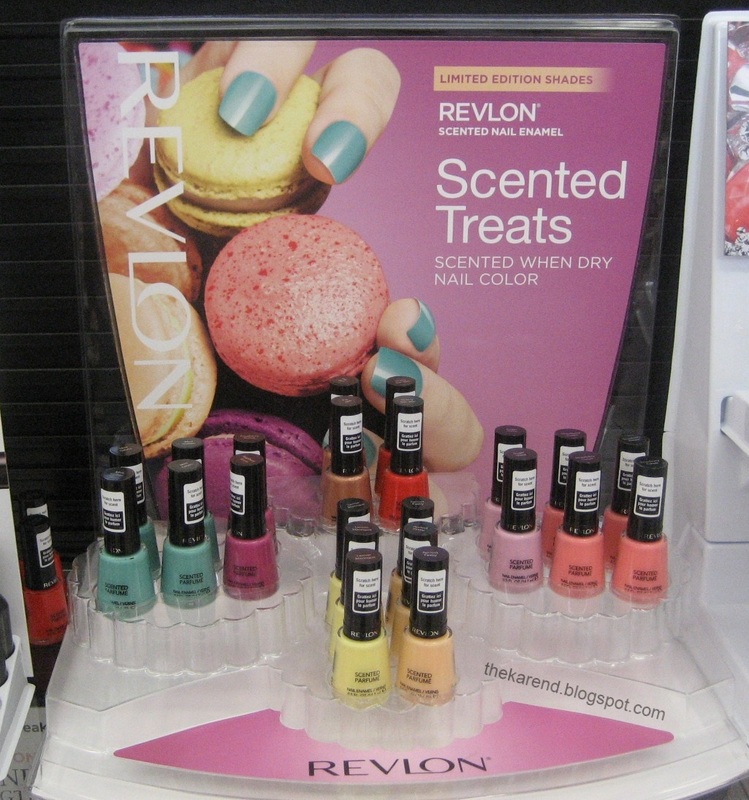 Revlon has also released some new scented polishes, in a collection called Scented Treats, and this display does say it's limited edition. In contrast to last year's glass flecked scented shades, these are mostly milky cremes. Eight colors: Lemon Meringue (yellow), Apricot Pastry (very pale orange), Mint Gelato (teal), Raspberry Scone (soft plum), Sugar Glaze (pink), Strawberry Cream (light peachy orange), Fig Jam (light copper, the only shimmer in the bunch), Cherry Bon Bon (red). 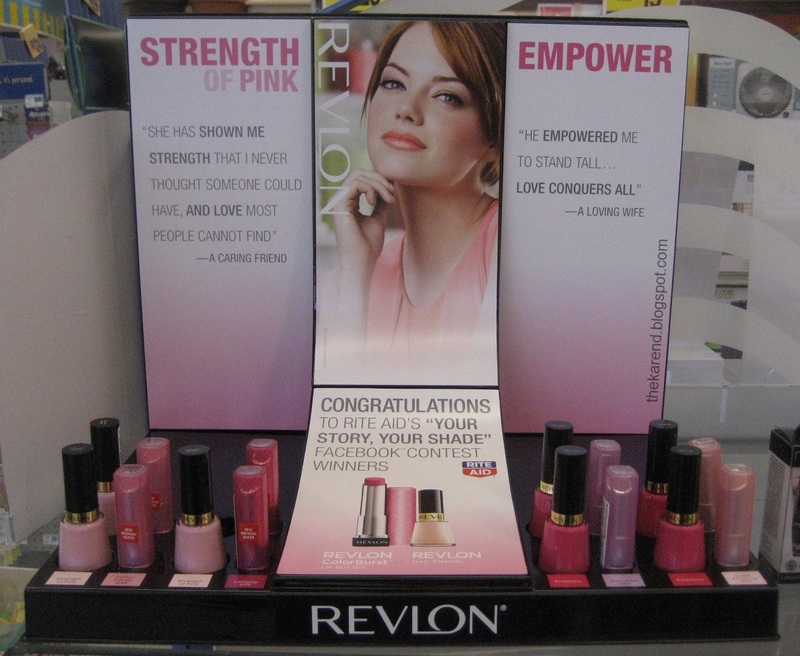 The last new Revlon display I saw was at Rite Aid and seems to have something to do with a Facebook contest. There are two shades of pink polish here: Strength of Pink (the lighter one) and Empower (the darker). 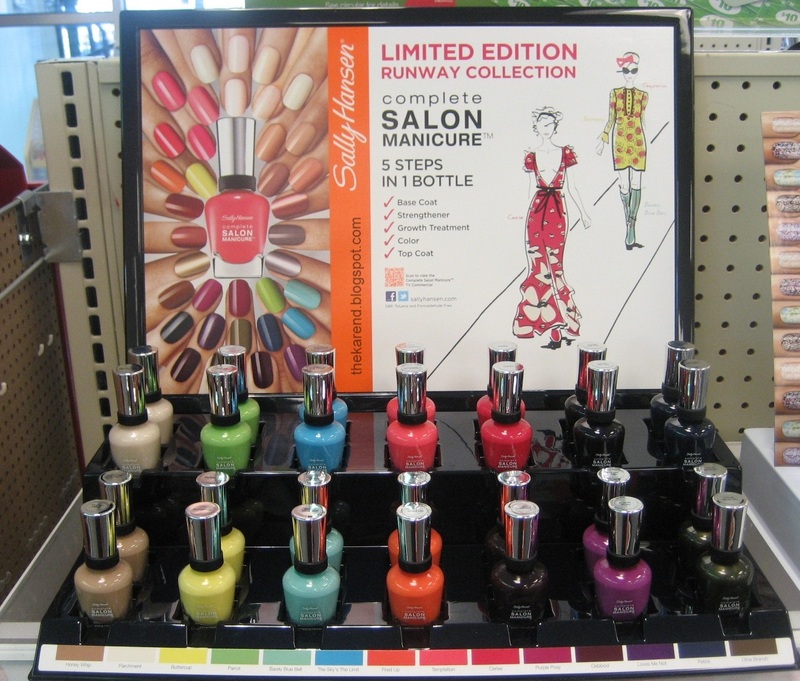 Sally Hansen Complete Salon Manicure limited edition Runway Collection is a mix of neutrals, summer brights, and vampies. I've seen this one at CVS and Ulta. Front two rows, left to right: Honey Whip, Buttercup, Barely Blue Bell, Fired Up, Oxblood, Purple Posy, Olive Branch. Back two rows: Parchment, Parrot, The Sky's the Limit, Temptation, Cerise, Loves Me Not, Petrol. 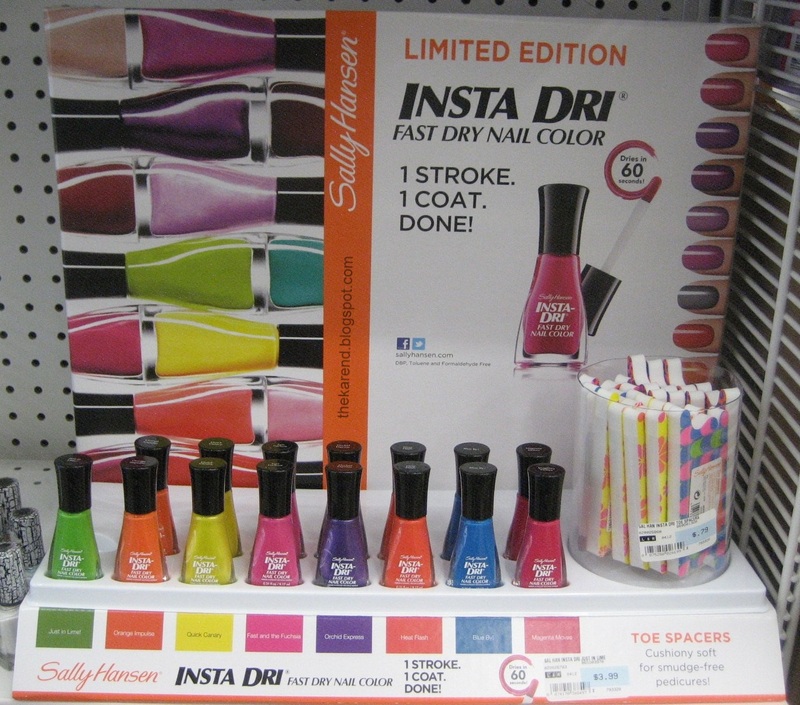 There are eight new Sally Hansen Limited Edition Insta Dri colors: Just in Lime, Orange Impulse, Quick Canary, Fast and the Fuchsia, Orchid Express, Heat Flash, Blue By, Magenta Moves. There are also some colorful toe separators on this display. 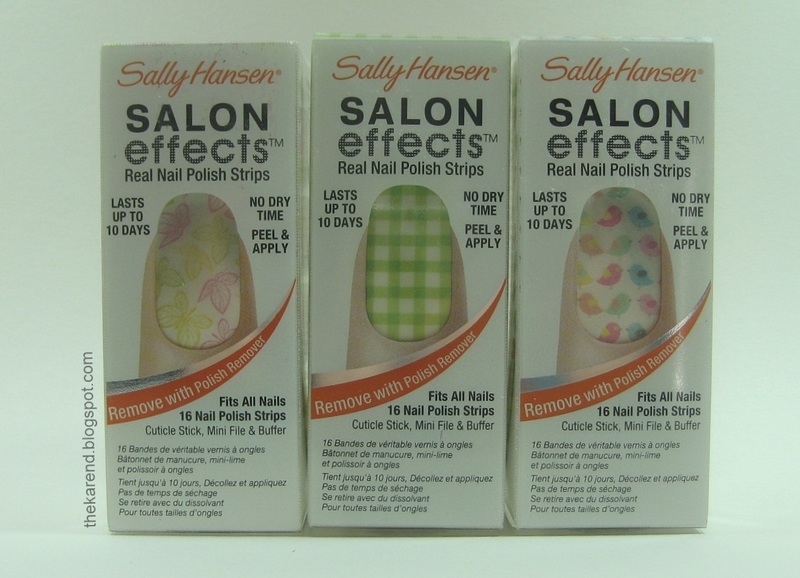 Given that there have been three limited edtion collections of Sally Hansen Salon Effects Strips since the beginning of the year, I thought they might take a break, but no, there are still more new ones. 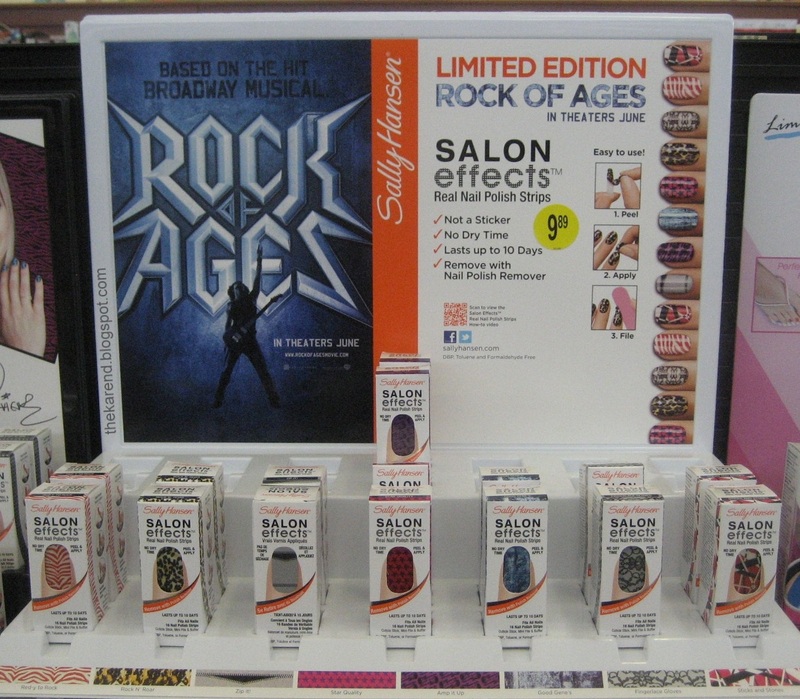 These are a tie-in with the Rock of Ages movie that's coming in June. There are eight designs: Red-y to Rock (red and white zebra), Rock 'n' Roar (black/yellow cheetah), Zip It (silver/black zipper), Star Quality (purple stars on hot pink), Amp it Up (black guitars on red violet), Good Gene's (distressed denim), Fingerlace Gloves (black lace on white), Sticks and Stones (red/white/black abstract). 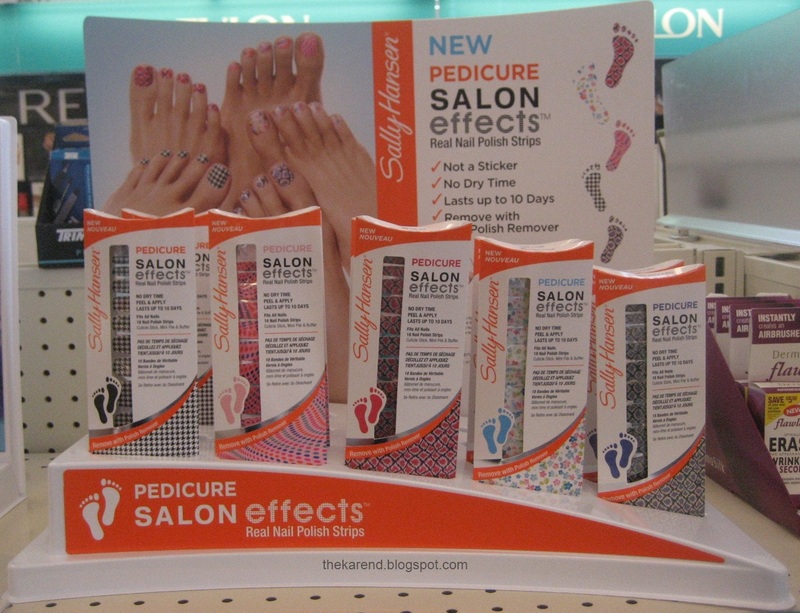 But wait, there are even more Sally Hansen strips! These are Pedicure Salon Effects, and there are five designs: Puppytooth (black/white houndstooth), Toe-riffic (op art dots on pink), Pink Boa (pink/black snakeskin), Strike a Posie (blue and pink flowers on white), and Snake Rattle & Roll (periwinkle/black snakeskin, which I have on right now and will report on after I know how well they last). 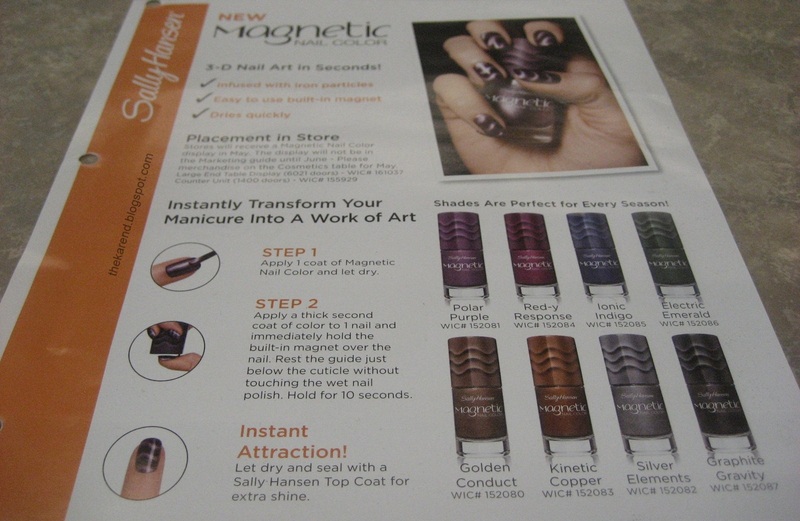 I haven't seen the polishes yet, but I got a peek at a brochure for Sally Hansen magnetics. Looks like there will be eight colors: Polar Purple, Red-y Response, Iconic Indigo, Electric Emerald, Golden Conduct, Kinetic Copper, Silver Elements, and Graphite Gravity. 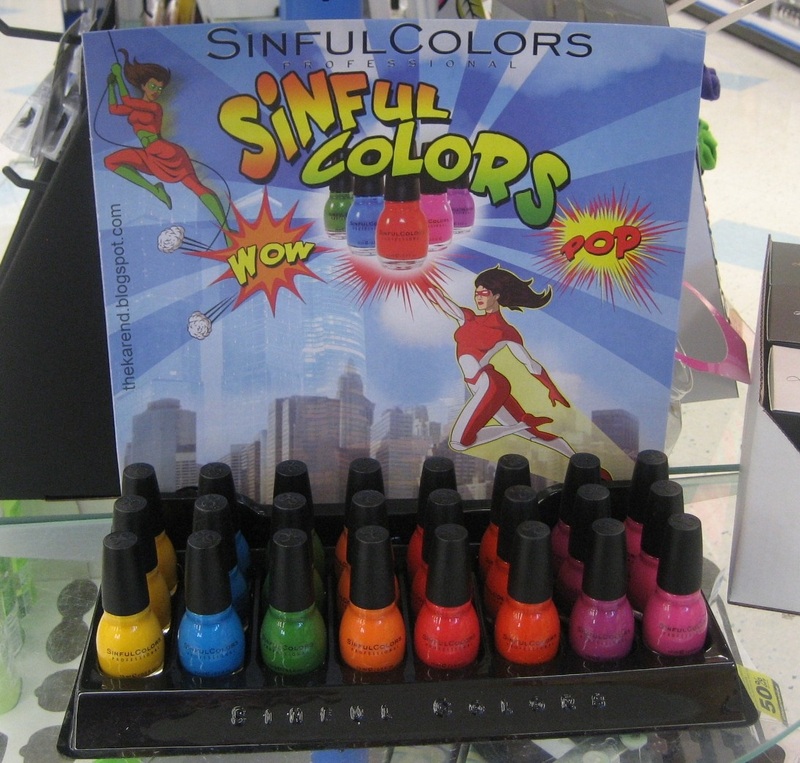 In what might be an attempt to take advantage of the Avengers movie hype, Sinful Colors has a comic book themed display that might be called Wow Pop (it's hard to tell). In what is surely part of their ongoing effort to confuse me, it's a mix of old and new colors: Let's Meet, Why Not, Exotic Green, Clementine, Energetic Red, Citrine, Outrages (yep, -rages), Dressed to Kill. The first two I know I've seen before (most recently, they were in the Color Block display which I shared at the end of March); the others I didn't recognize, but it's so hard to keep up with Sinful I can't say for sure that they're new. It's been a little while since we had a Sinful Colors inspired-by-OPI display, but now there's Be Fierce, which looks to be their version of the Nicki Minaj collection. Colors are: Savage, Secret Admirer, Pink Forever, Innocent, Queen of Beauty, and Fig. I believe we've seen all of these before, just not in this grouping. 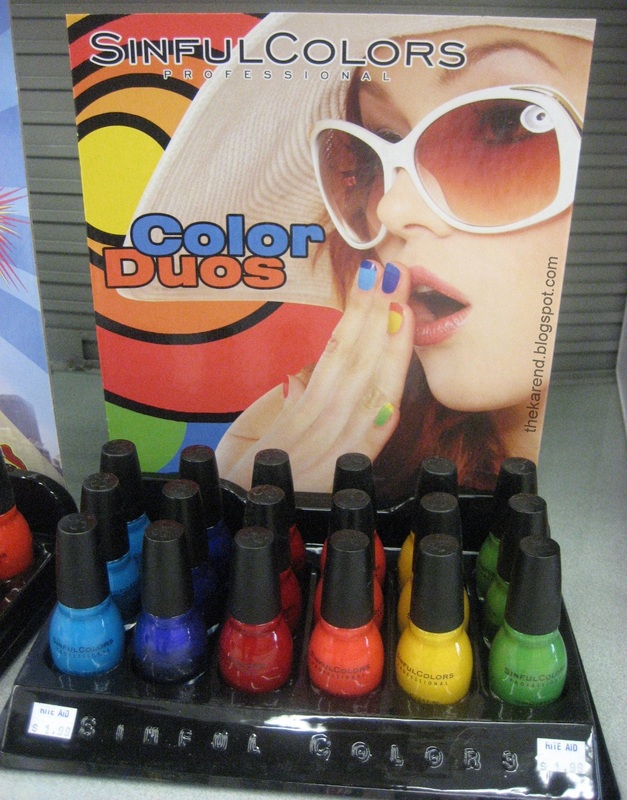 The Sinful display called Color Duos confused me because it had the same six shades as the aforementioned Color Block display (Why Not, Let's Talk, Ruby Ruby, Big Daddy, Let's Meet, and Happy Ending) and the same manicure concept on the model (Funky French Skittles). Why put out both of these? Is it some sort of contest between competing ideas out of the marketing department? 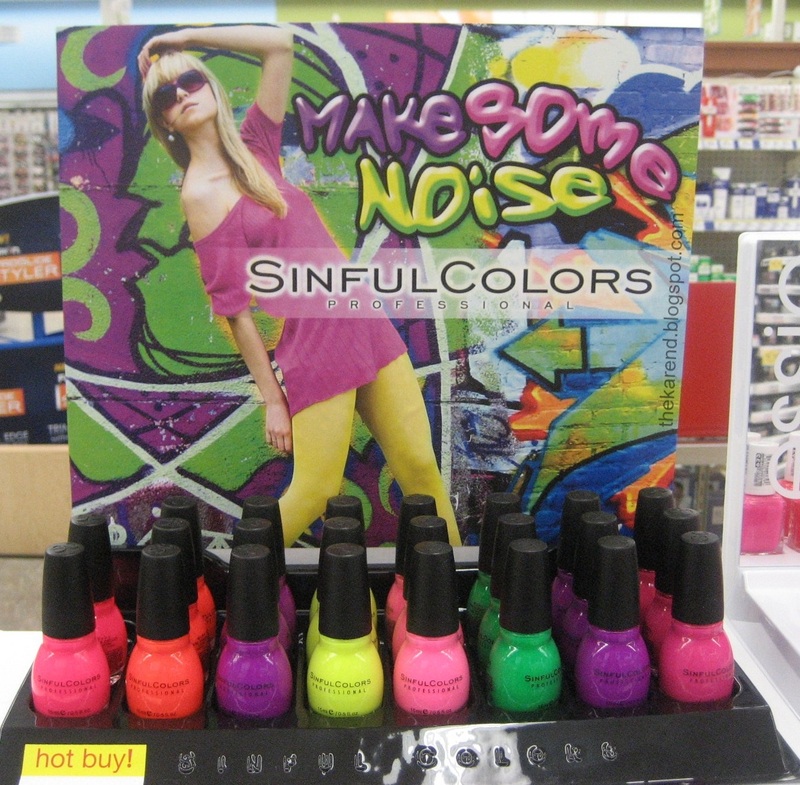 Summer always means the re-promote of Sinful Colors neons. The Make Some Noise display I saw at Walgreens had Pink, Summer Peach, Dream On, Neon Melon, Fusion Neon, Irish Green, Dream On (again), and Cream Pink. 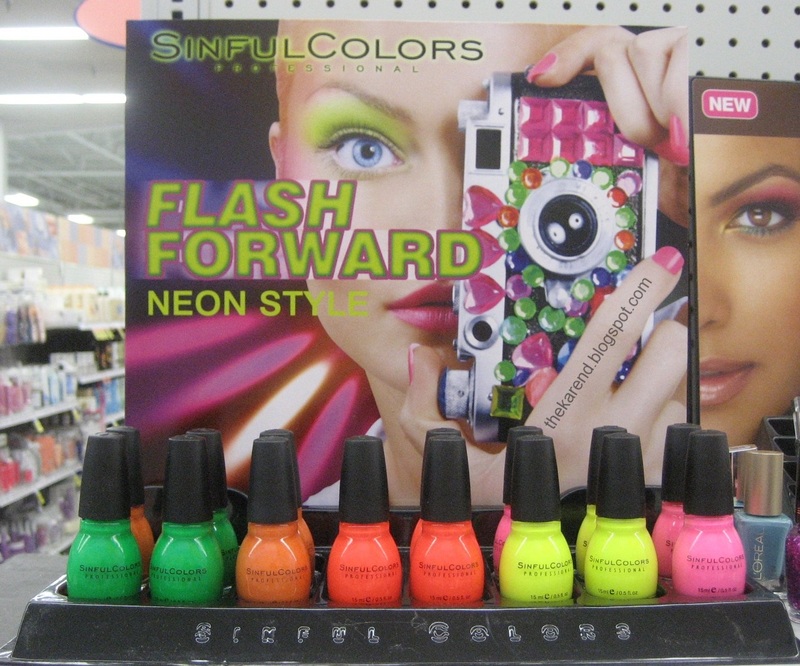 At Meijer, I saw a different Sinful neon display called Flash Forward. Which colors this had in it varied by store, but none had any colors I hadn't seen in other places. 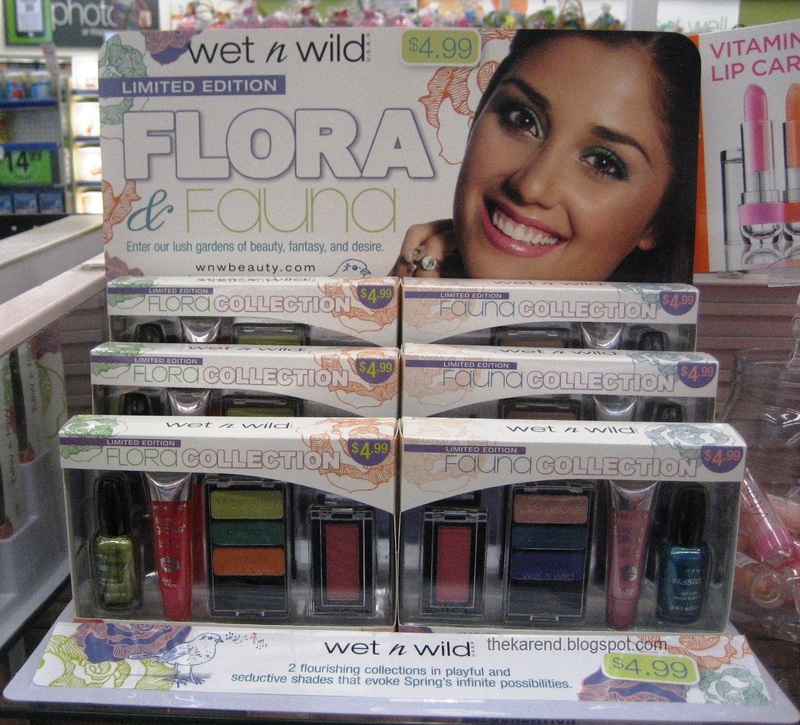 The Wet 'n' Wild limited edition Flora & Fauna makeup collections each have a FastDry nail polish in them. Flora has a lime green shimmer called Twining Vines that in the bottle looks very close to Ocean Grotto from last year's Mermaid's Cove limited edition collection. Fauna has Teal or No Teal, a deep turquoise shimmer; this appears to be a core color, not even renamed to fit to Fauna theme. I've seen these kits at CVS and Walgreens and Rite Aid. 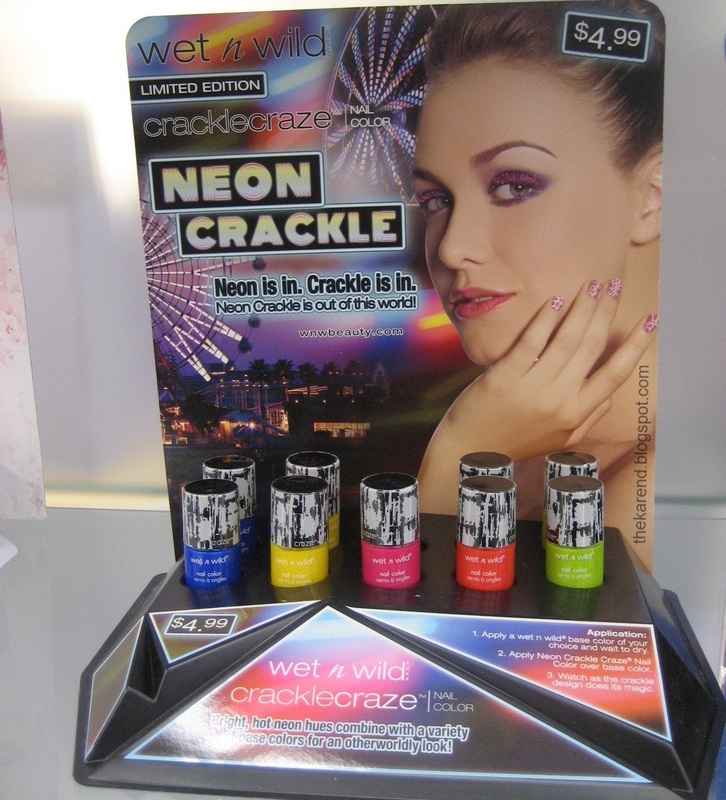 Per the Wet 'n' Wild CrackleCraze Neon Crackle display: "Neon is in. Crackle is in. Neon crackle is out of this world!" Five colors here: Blue a Fuse (the only shimmer crack in the bunch), Construction Zone, Pretty Pink Punk, Inmate in Love, Living in the Limelight. I've only seen these at Rite Aid. 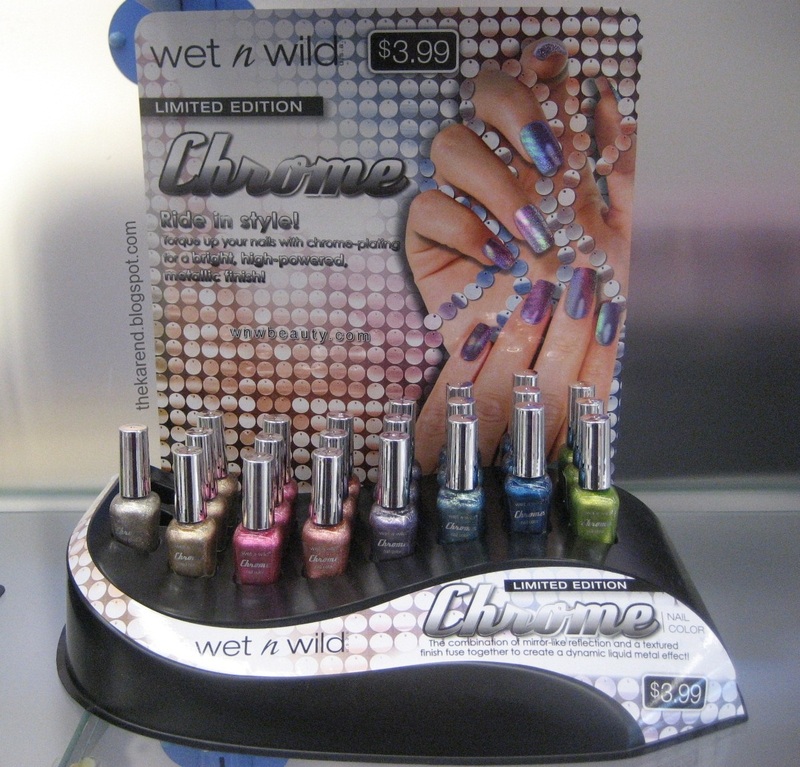 In case neon crack isn't your thing, Wet 'n' Wild has another limited edition collection out: Chrome. Eight foil shades here, left to right: Steel the Spotlight, A Show at the Palladium, Precious Petals, Penny for Your Thoughts, Hog-Quartz School, Stay Outta My Bismuth (really? bismuth? ), Grew Up in Cobalt-imore, I Got a New Com-pewter (I don't get why the lime green one has pewter in the name). Zoya spring shades appeared at my Ulta as usual—weeks after I'd bought the ones I wanted directly from Zoya. The display has both spring collections in it: the three Fleck Effect colors (Maisie, Opal, and Chloe), and the six colors from True (Skylar, Tru, Lotus, Cho, Farah, and Bevin). 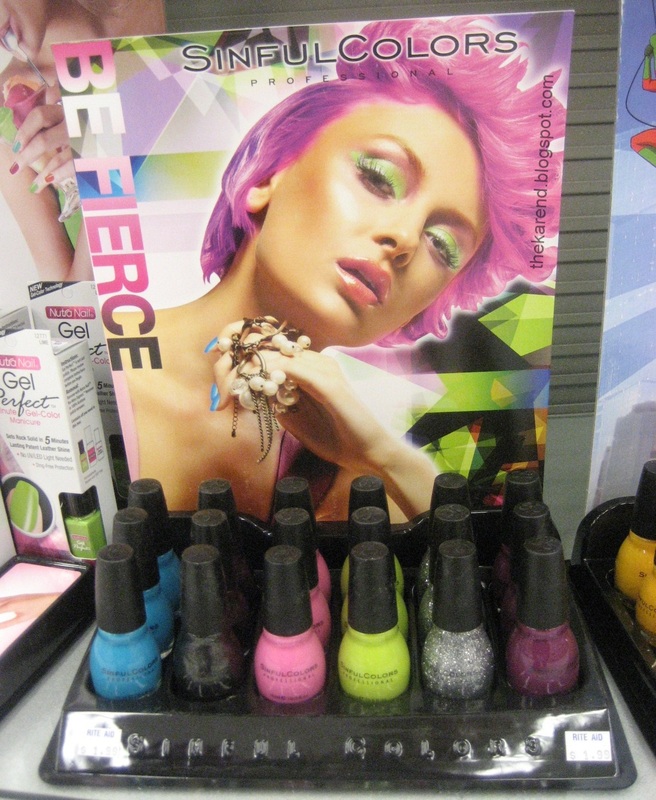 I will leave you with this craziness I spotted at Ulta: Orly Mineral FX colors stuck into a China Glaze Eye Candy display. Who does this?! 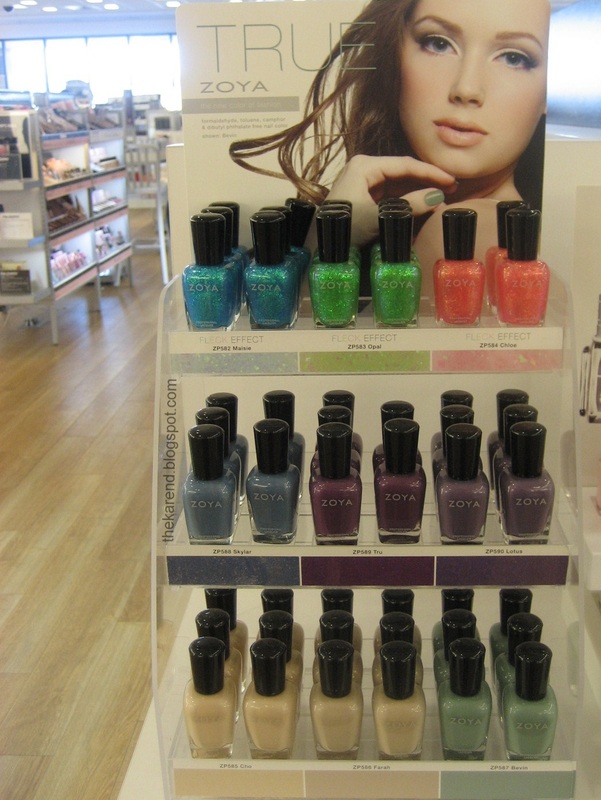 Where has that display been since the polishes sold out this winter? Did they throw out the Mineral FX display and then found more stock? I wonder if there's a job that involves just going around and straightening up nail polish displays; I'd be good at that. The folks at Nicole by OPI (a.k.a. NOPI) are doing their very best to win me over. 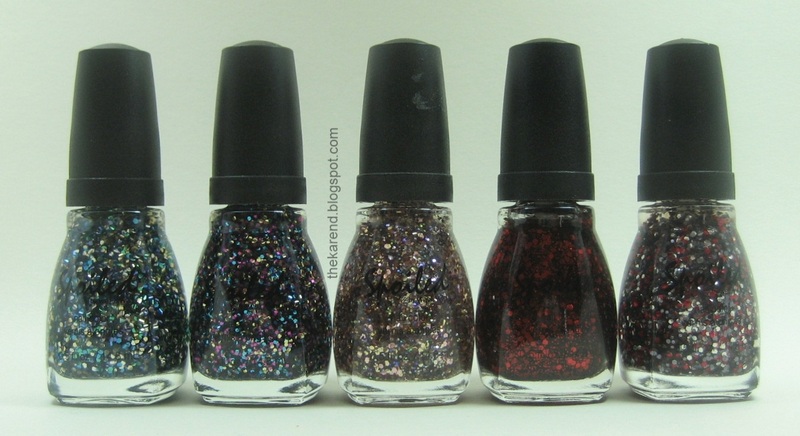 You already know they sent the Wel-Kim to My World polishes, which I ended up liking some of so much that I bought my own bottles after I sent the review bottles to Lucy, who'd done all the work to get them. They also sent many bottles of Texture Coat, also known as crack, and you know I love me some crack. I don't care if this trend is waning, I remain addicted. Left to right below: Opal Texture, Turquoise Texture, Amethyst Texture, Aquamarine Texture, and Quartz Texture. All of these are new releases for Spring 2012 except Turquoise. The first one I grabbed to try was Quartz Texture. I put one thick coat over NOPI Others Pale by Kim-parison. I didn't add topcoat in order to better show off the texture. You can probably see in the photo below that this can leave some sparkly bits on the skin during cleanup, but it's nothing that wouldn't come off easily if I were just a bit less distractable when faced with so many polishes to play with. I really like the color of this one; it's not something I've seen a lot of in crack polishes and the purple-y undertone is flattering to my skin. Here's Quartz next to Silver Texture so you can see the difference. Opal Texture intrigued me, but I think the NOPI Up & Kim-ing Pink I used it on was the wrong base color for it, as there wasn't enough contrast and the combination just ended up looking like a really lumpily applied pink from many angles. I did get glimpses of how pretty it could be, though. Glitter and crack seems like it would the perfect combination for me, but when put on NOPI Lights Kim-era Action and then topped it with Aquamarine Texture and an accent nail of Turquoise Texture, I was underwhelmed. Again, I think maybe a different base color would have been better, and possibly a thicker coat of the texture. I tried something different with the other glittery crack, Amethyst Texture. I started with a base of Up and Kim-ing Pink, then added White Texture, then put Amethyst Texture on top. It was interesting to see how the glitter mostly followed the lead of the white. 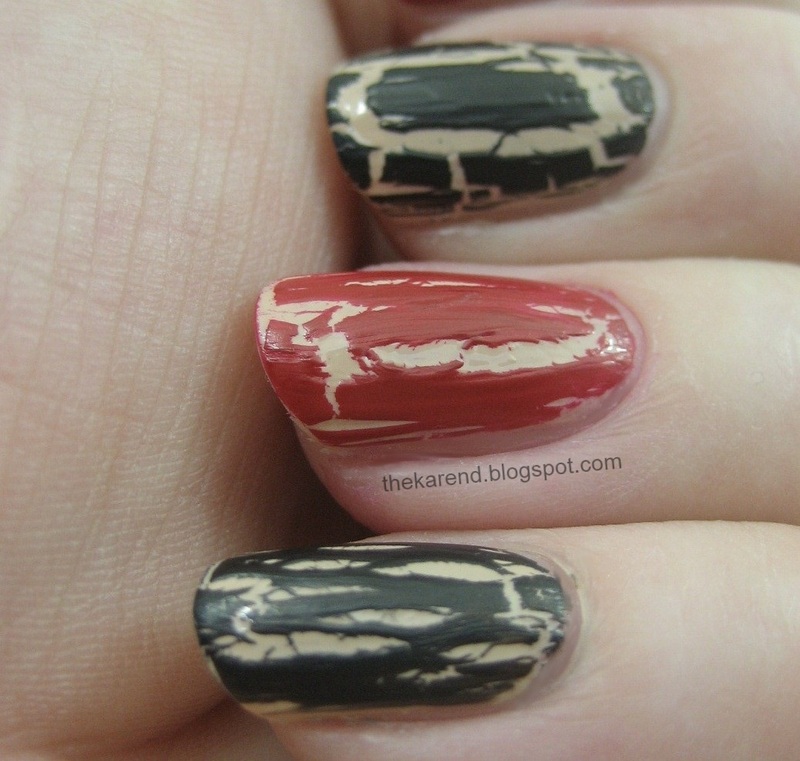 As long as you come back, go look at what Lucy did with these four new Texture Coat polishes. She got much more drama (in a good way) out of Opal and the glitters than I did. At this point, you may be saying to yourself, "hey, she showed us silver and white crack; those weren't in the bottle pics". That is correct; they are in the next bottle photo, because NOPI sent more crack than I could fit into one photo. Left to right below: White Texture, Silver Texture, Gold Texture, Red Texture, and Black Texture. I tried the Gold Texture over Here Kim's the Sun; the sparkles peeking out through the cracks pleased me. I alternated the Red Texture and Black Texture over Kim Konfidential. 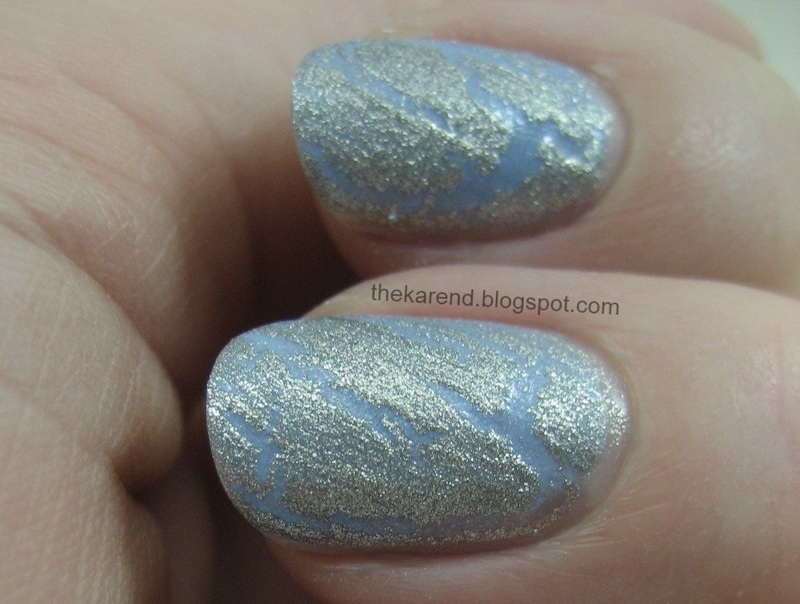 For the last one, Silver Texture, I applied it diagonally over Nothing Kim-pares to Blue. I really liked how this turned out. I think crackle will always have a place in my stash because it's nice to have options.